I was just thinking of my friends, and thinking about how fast the time is passing. I set a goal to keep in better touch with my friends, and write more hand written letters. I MISS YOU GUYS. I actually haven't got a handwritten letter from a friends in over 2 months now and its kinda bumming me out. So if you write me a letter I will write you one back. I know i need to do better. SO HOLLER AT ME. I want to get caught up! This is a foto from about 2 years. 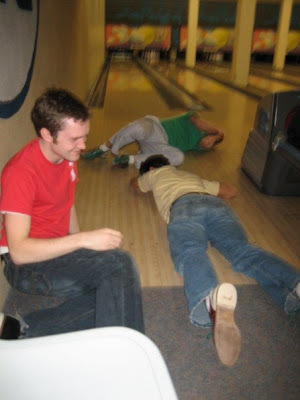 I miss playing bowling because we used to make punishments if we didn't achieve a certain goal. This is us losing and realizing that we had to get air-soft shots in the chest... It really made the games intense. i fail! i said i'd send you something like ages ago and it still hasn't gone out yet. bah. your posts always make me laugh jase. Airsoft guns to the chest...so random.